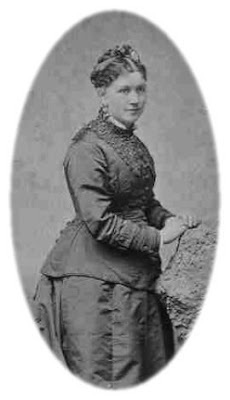 A familiar face looked out at me from my friend JamaGenie's blog today: a photograph of my maternal great great grandmother, Sophia Window Filley, taken soon after she arrived in America from her native England in 1879. Jama reminded me that today is her birthday. She was born 171 years ago. She was born in 1838. The date on her tombstone is incorrect. I have the birth records and the family bible to prove it. I wonder if she lied about her age. The notion made me laugh. She died in 1918,long before I was born, but because of photos like this and the family stories that my grandmother, who knew and loved her, told me, I feel a sense of powerful connection to this woman. At least a few of her genes and chromosomes survive in me and that makes us kin. So, happy birthday Sophia. I don't live close enough to put flowers on your grave, but I'll go over to the Find A Grave website and leave a virtual bouquet. Sophia was quite a woman. She came to America with three teen aged children to track down an errant husband (not her smartest move IMHO) She ended up selling her wedding silver, linens and jewelry to finance some pretty hair brained business schemes and to keep the family from starving. Eventually the living got pretty rough and the husband, one Frederick Haime Window, ended up gone. Too proud to go back to England, she moved, for some reason now lost in the mists of time, to Burlingame, Kansas and ended up making a respectable living as a dressmaker and milliner in a town that was only a few years away from it's frontier roots as a stop on the Santa Fe Trail. She remarried H.W. Filley,a widower, and local worthy. When her oldest daughter died at the age of 32 leaving four young motherless children, she took them in and did the mother thing all over again with her grandchildren, one of whom was the grandmother about whom I have written elsewhere and whose stories made Sophia a real and living presence for me when I was a child. 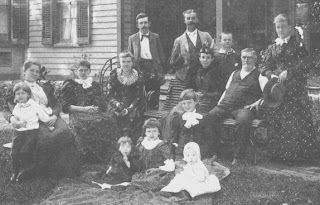 Here's a photograph taken at a family gathering in the early 1890's. Grandma Filley is the woman on the far right in the print dress. She's leaning on her husband, H.W. Filley who is seated. I could identify all the people in the photo, but I won't. I will only point out that my grandmother is one of the three children seated on the ground. She's the one in the middle. The two babies are her cousins. I'm not sure what the occasion was. I only know that thanks to Jama, the occasion to celebrate today is Sophia's birthday. Happy Birthday, Sophia. Somewhere Sophia is beaming! What a great tribute for her day! I was going to add the other photo you mentioned to the post on Sat's Child, but this one at 41 is the best, and she even looks to be dressed for a party. It could only be better if she were wearing one of her millinery creations bedecked with ribbons and bows that she was so famous for in Burlingame! What an admirable, amazing woman! What happened to the husband, exactly? Did she find him? Right you are Jama and she looks pretty good for 41-- I'm so glad that you remembered her birthday and in fact that you were kind enough to do so much detective work in tracking down the story of Frederick and Sophia and the kids. There is still so much we don't know. She was quite something, London Girl and I imagine the Western prairies were not exactly what she thought she was getting into when she let Plymouth. Not sure what happened to Frederick.He was something of a bad apple I think. Her father didn't want her to marry him in the first place. 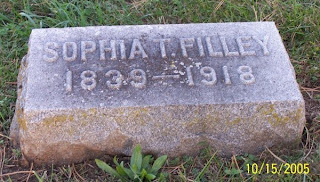 There is a note in the family bible that he died in Fulton Missouri on July 14th or 15th of 1886. The note is in Sophia's hand. Funny thing though, there is no record of his death or burial in Missouri or Kansas sooooooo what did happen? Who knows. Records were not so well kept on the frontier in those days so maybe he died-- but maybe he didn't and Sophia wrote that note in the bible because she preferred being a widow to an abandoned wife. There are lots of mysteries about her. I have other pictures and some letters too. I'll write more about her and her life in America probably on Hubpages.